RamSmash is a tool for all which allows you to maintain and manage memory the right way. No modifications to your hardware are made and all adjustments and settings are done in an easy to use interface that a child could use. Most other Rammemory modifiers promise that they work while you notice no difference at all in performance. RamSmash on the other hand has been tried and tested and proven to work. 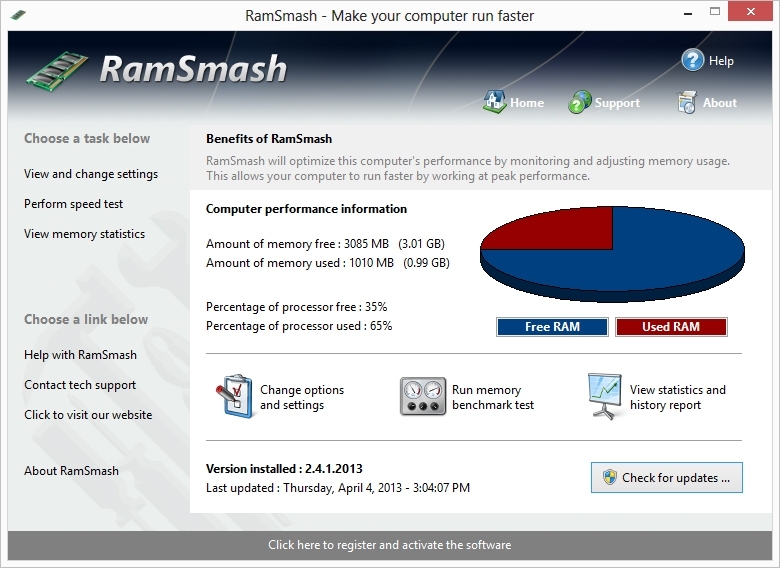 Are you tired of program crashes or low memory warnings Or you notice your computer performance slowly degrades after a period of time RamSmash not only fixes these problems from occurring it also enhances your computers performance. Keep Windows running longer by using RamSmash! No longer do you have to reboot your computer due to low memory warnings you choose the amount of memory your computer maintains and RamSmash releases wasted memory and returns it back to you. RamSmash will super charge your computers memory.